This week, we’re featuring several visitors’ hopes or messages to their future selves. 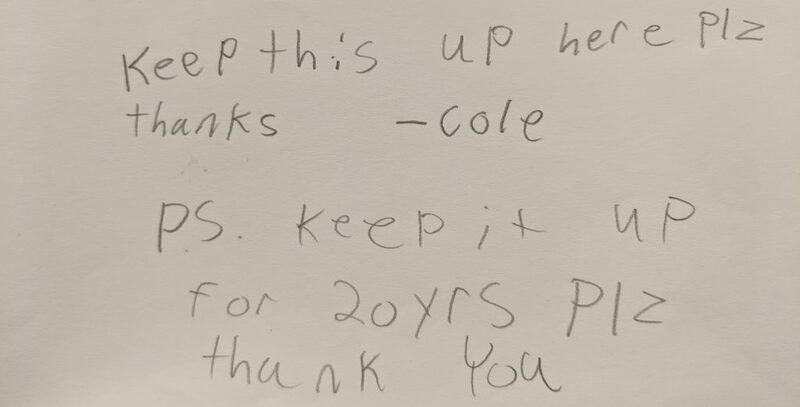 Cole, we couldn’t keep your note on the wall for the next 20 years (unfortunately), but we CAN post it here to stay online forever. pizza rocks and people like it too, like people who are weid weird sorry my writing is bad. Zoos are nice because of the animals. Gameworks is the best arcade. so, hi older me you are probably reading this so hi. Ash and Vig, everything will work out, don’t worry. At least you have letters to keep you close! I’m sorry for leaving home. I hope that I will be able to visit more. I know that you think that I am getting a good education, but it is hard to be so far away. Some days I wish I stayed home, around people I knew. It isn’t easy some days. I look forward to when I can see you again, hopefully that will be soon. Someday we will be able to look back and be glad that we made the choices that we made. Hopefully these four years will go by quickly and we will be able to spend much more time together. While it is more of a confession than a hope, there is still an element of wondering what the future will bring in this letter. Here is a big secret in my heart. It’s about you, but I hope you would never know that. I can’t see any future about what I’m eager for. Actually, I can even say I know nothing about you. We’re just friends in your eyes, right? I should be satisfied with the current situation, but I can’t control myself to miss you, like you, and work hard for you. This emotion makes me become a better person, even though you never know what makes me become what I am now. I’m just a tourism for you, which I consider as a tragedy. I know I shouldn’t think so much, my bad. Now, this printer knows my secret, it’s in Chicago. I will leave the story here, and decide to forget things that I shouldn’t remember here. I will go back finally, therefore, I should keep in mind that a dream is just dream. Hope you will be happy and healthy forever. This entry was posted in Blog and tagged awmstoryoftheday, awmstoryoftheweek, Story of the Day, Story of the Week.